1 RSD Today/Tomorrow? 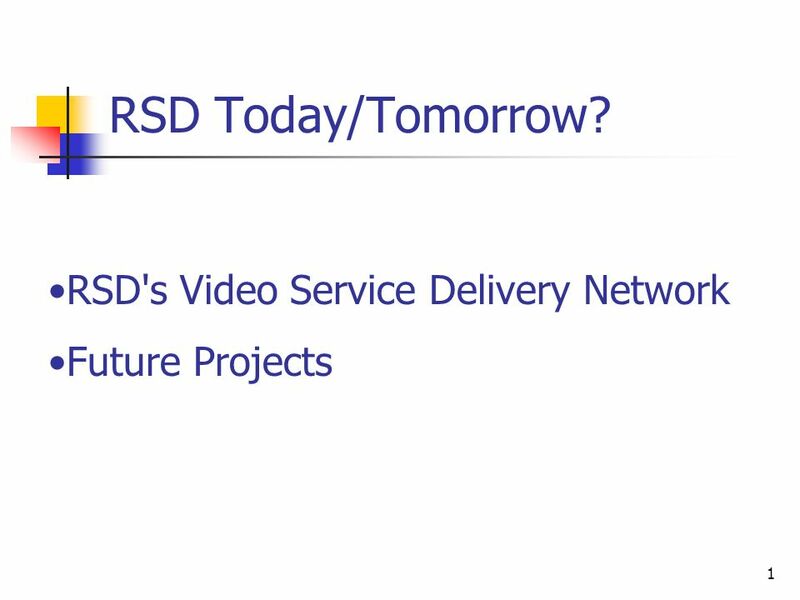 RSD's Video Service Delivery Network Future Projects. 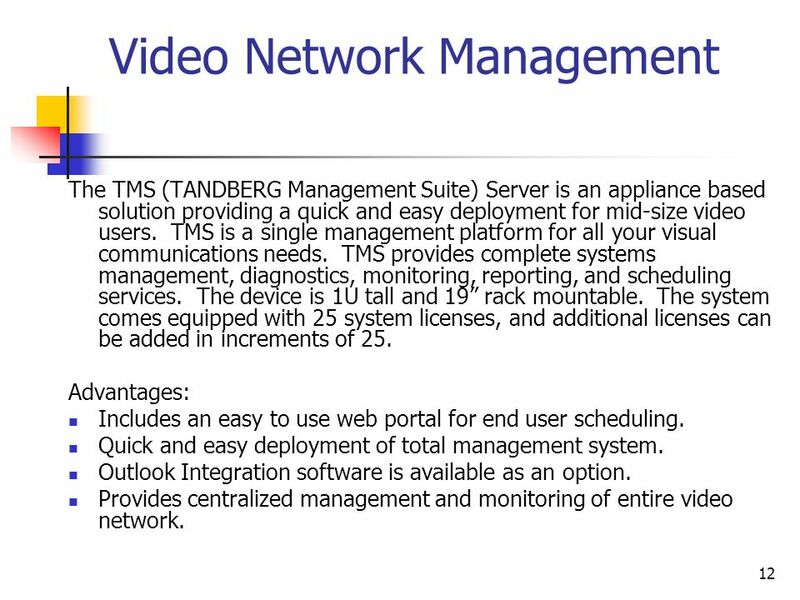 12 12 Video Network Management The TMS (TANDBERG Management Suite) Server is an appliance based solution providing a quick and easy deployment for mid-size video users. TMS is a single management platform for all your visual communications needs. 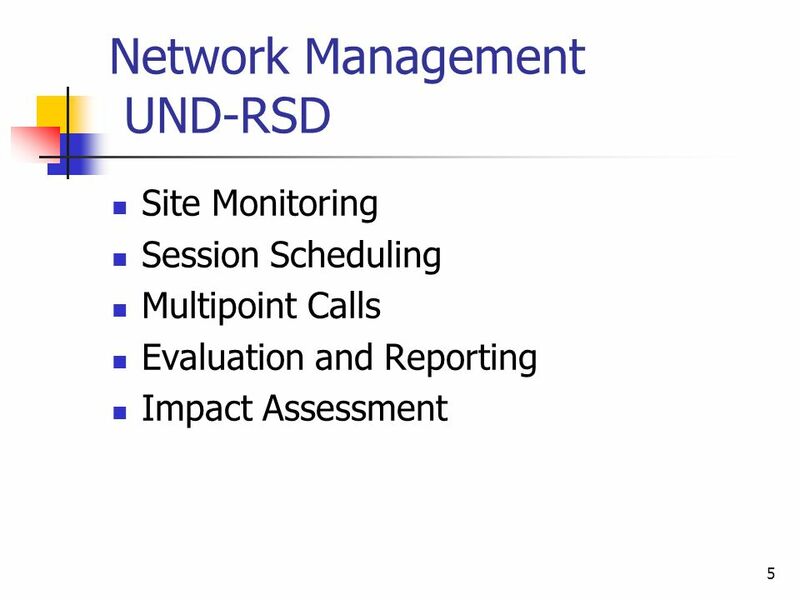 TMS provides complete systems management, diagnostics, monitoring, reporting, and scheduling services. The device is 1U tall and 19 rack mountable. The system comes equipped with 25 system licenses, and additional licenses can be added in increments of 25. Advantages: Includes an easy to use web portal for end user scheduling. Quick and easy deployment of total management system. Outlook Integration software is available as an option. Provides centralized management and monitoring of entire video network. 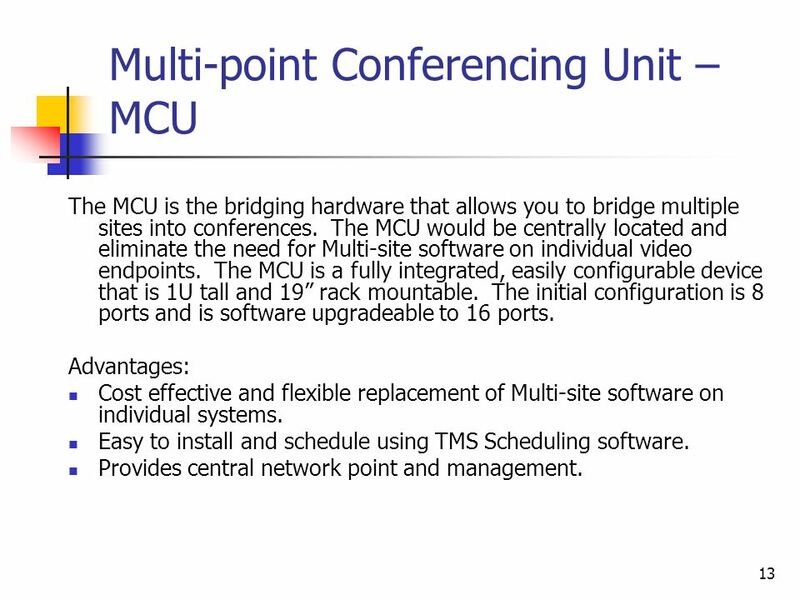 13 13 Multi-point Conferencing Unit – MCU The MCU is the bridging hardware that allows you to bridge multiple sites into conferences. 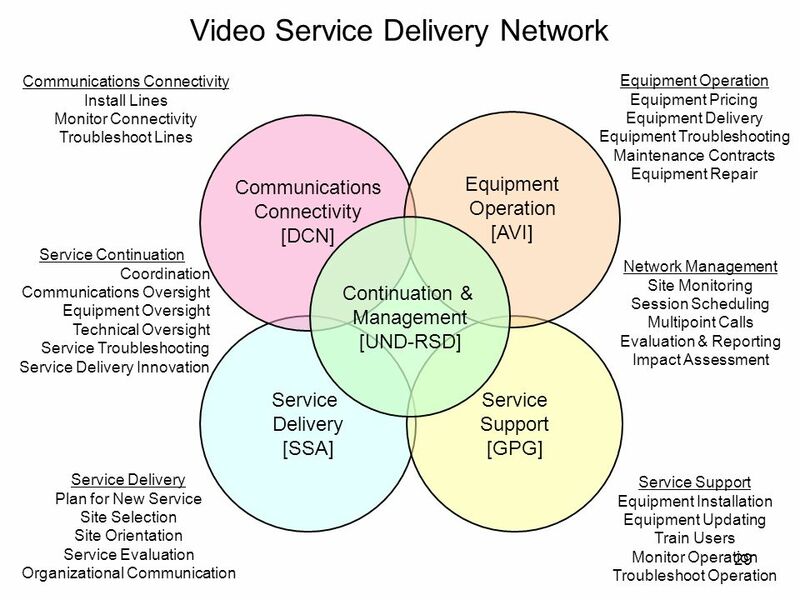 The MCU would be centrally located and eliminate the need for Multi-site software on individual video endpoints. The MCU is a fully integrated, easily configurable device that is 1U tall and 19 rack mountable. The initial configuration is 8 ports and is software upgradeable to 16 ports. 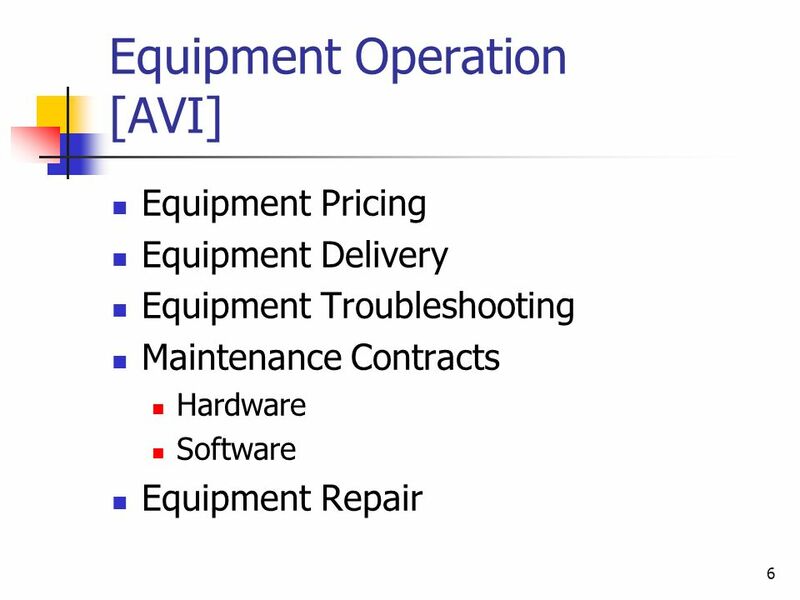 Advantages: Cost effective and flexible replacement of Multi-site software on individual systems. 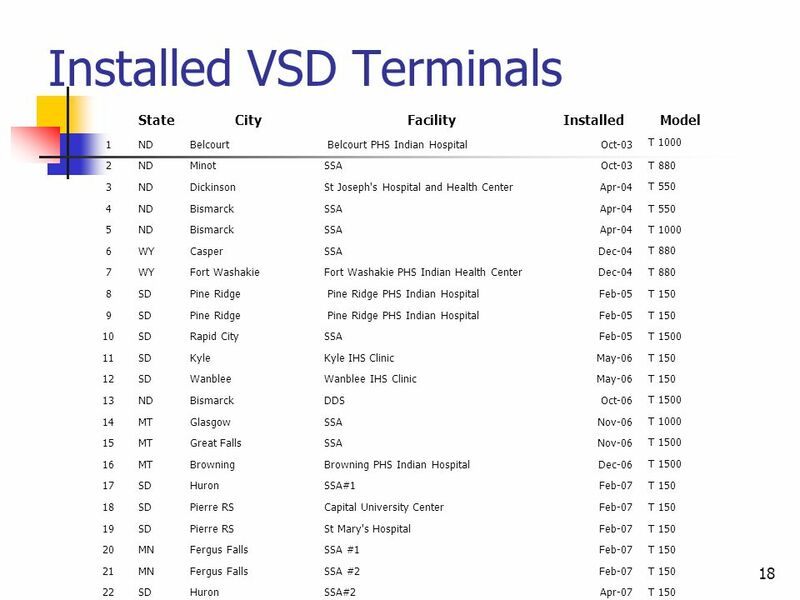 Easy to install and schedule using TMS Scheduling software. 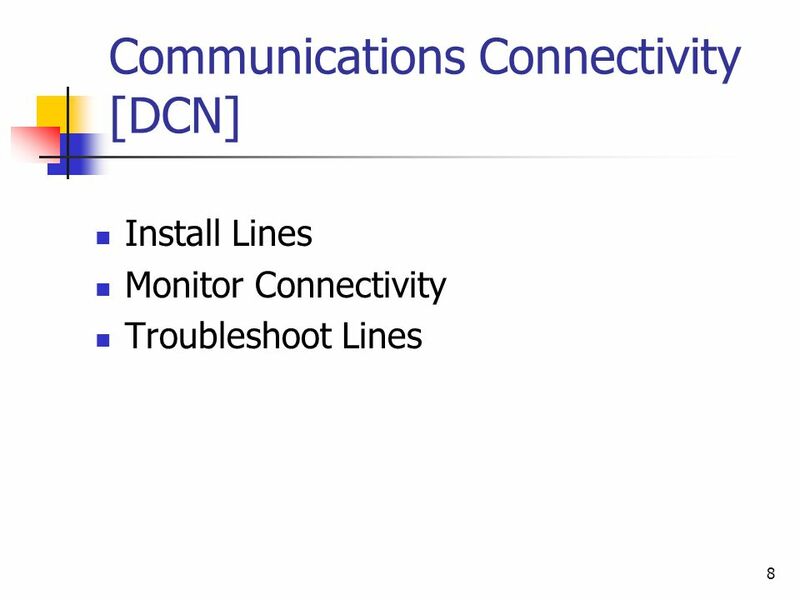 Provides central network point and management. 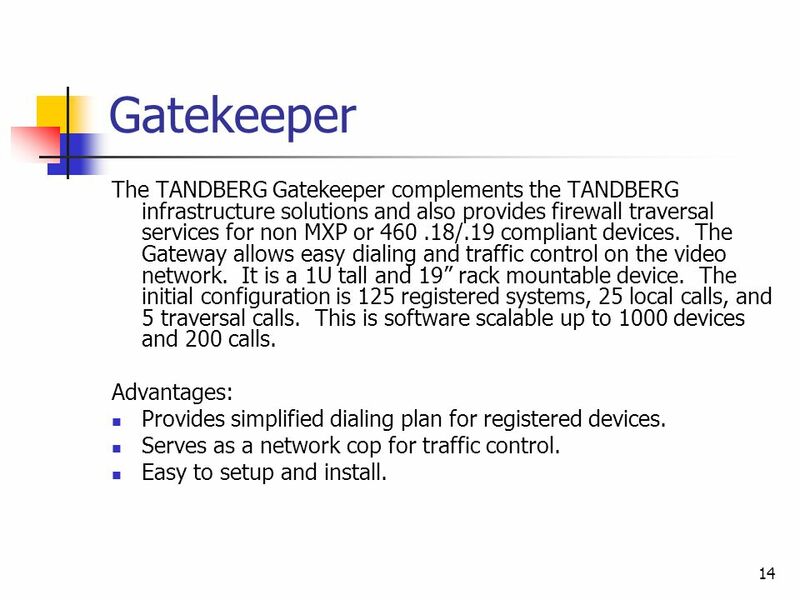 14 14 Gatekeeper The TANDBERG Gatekeeper complements the TANDBERG infrastructure solutions and also provides firewall traversal services for non MXP or 460.18/.19 compliant devices. 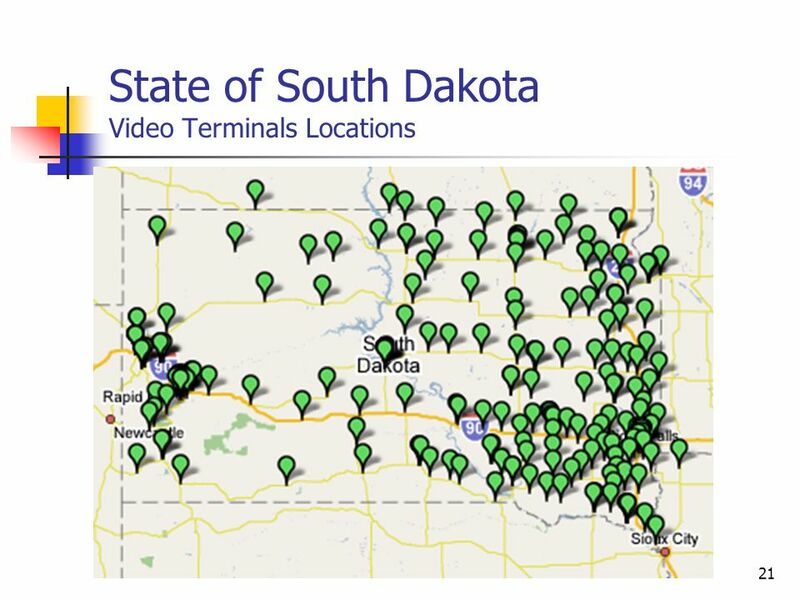 The Gateway allows easy dialing and traffic control on the video network. It is a 1U tall and 19 rack mountable device. 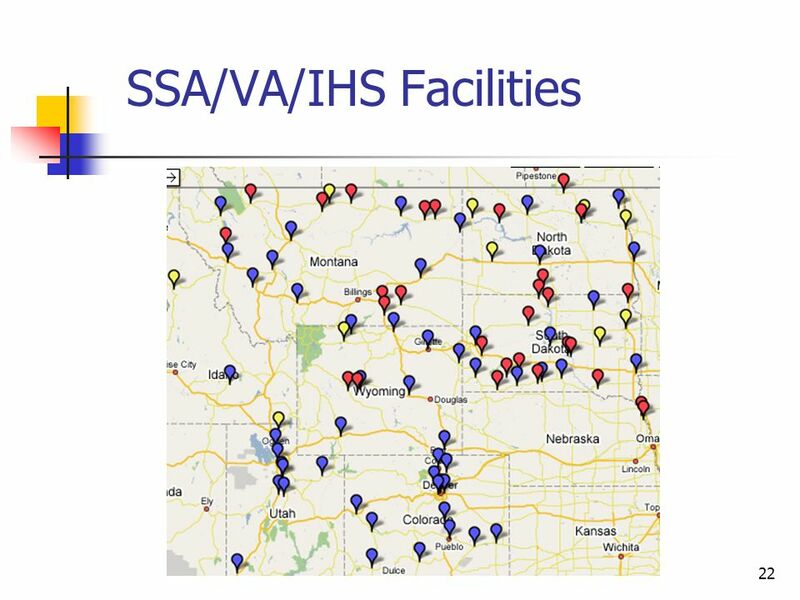 The initial configuration is 125 registered systems, 25 local calls, and 5 traversal calls. This is software scalable up to 1000 devices and 200 calls. Advantages: Provides simplified dialing plan for registered devices. Serves as a network cop for traffic control. Easy to setup and install. 15 15 Border Controller The TANDBERG Border Controller is part of the Expressway firewall traversal solution. 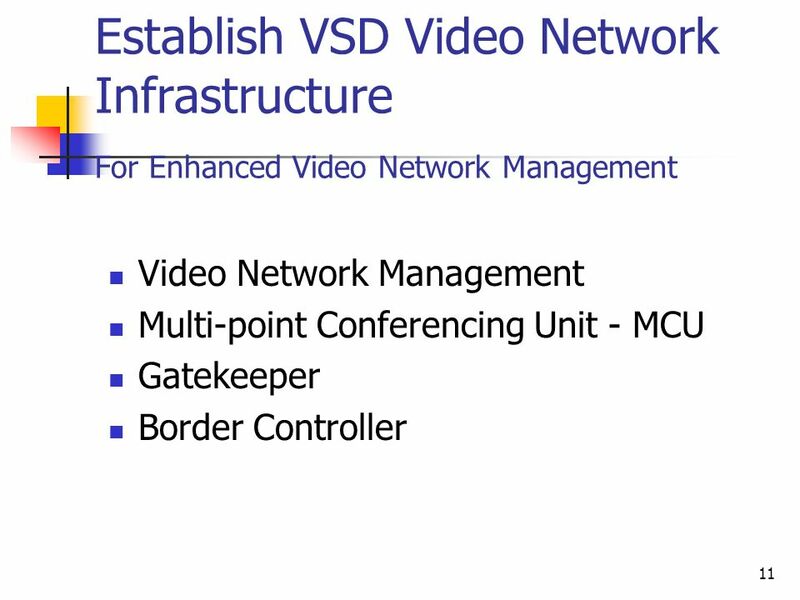 The Border Controller provides easy dialing and firewall traversal solutions for any H.323 video system. It is a 1U tall and 19 rack mountable unit. As an appliance based solution it allows for easy deployment and high reliability. 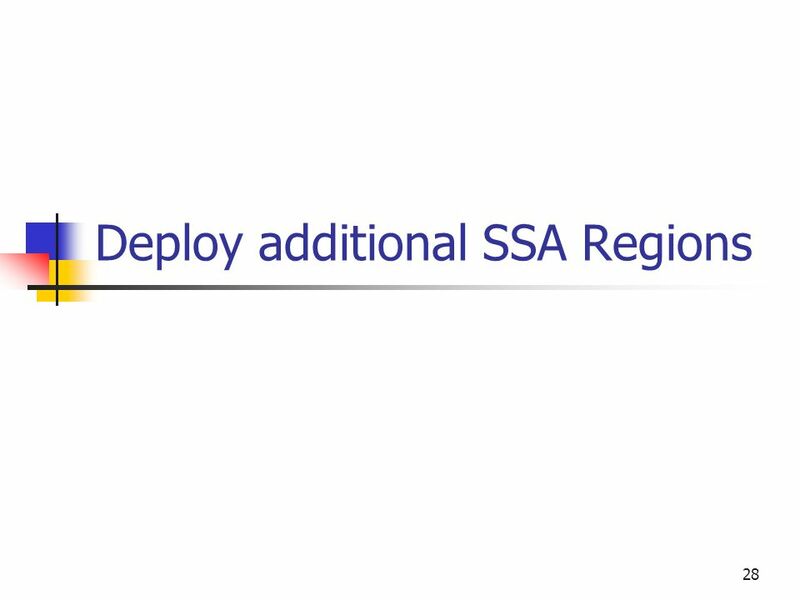 The initial configuration is for 25 registered systems and 5 traversal calls. 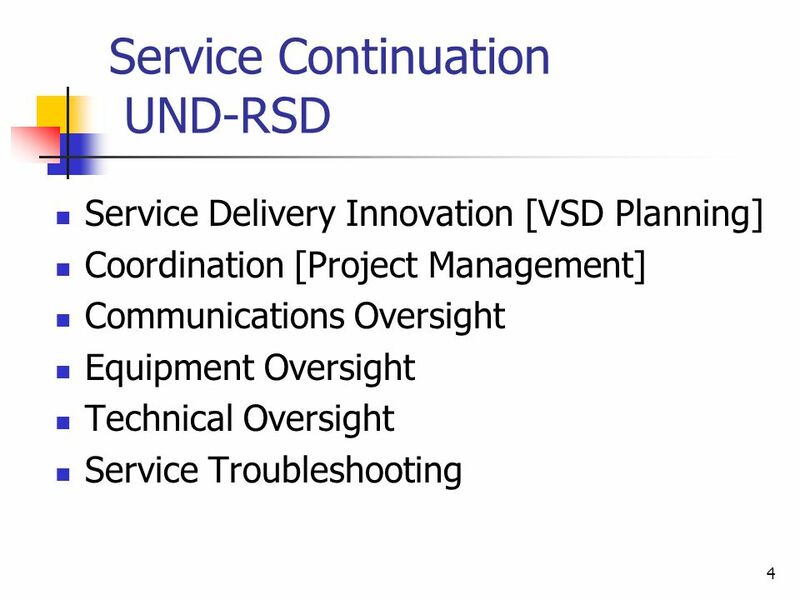 Software upgrades increase that capability to 500 devises and 100 concurrent traversal calls. 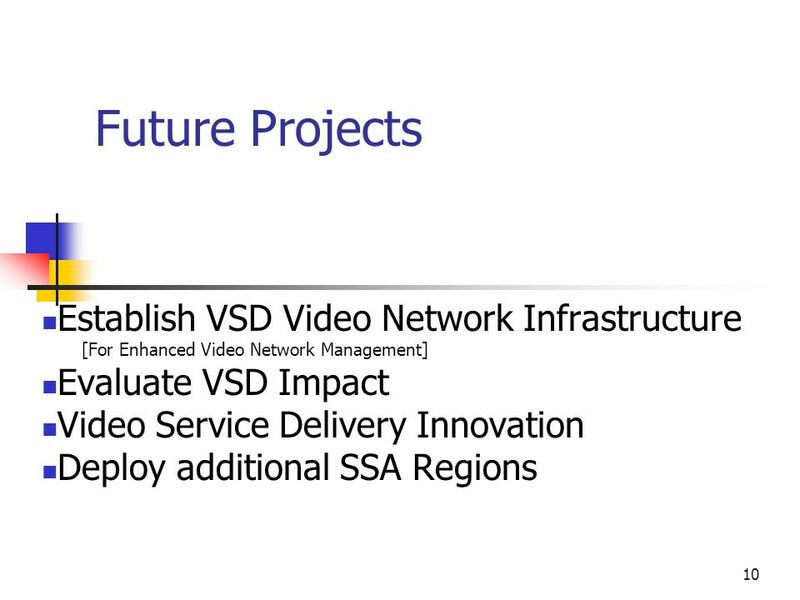 Advantages: More flexibility with video systems located behind end user firewalls. 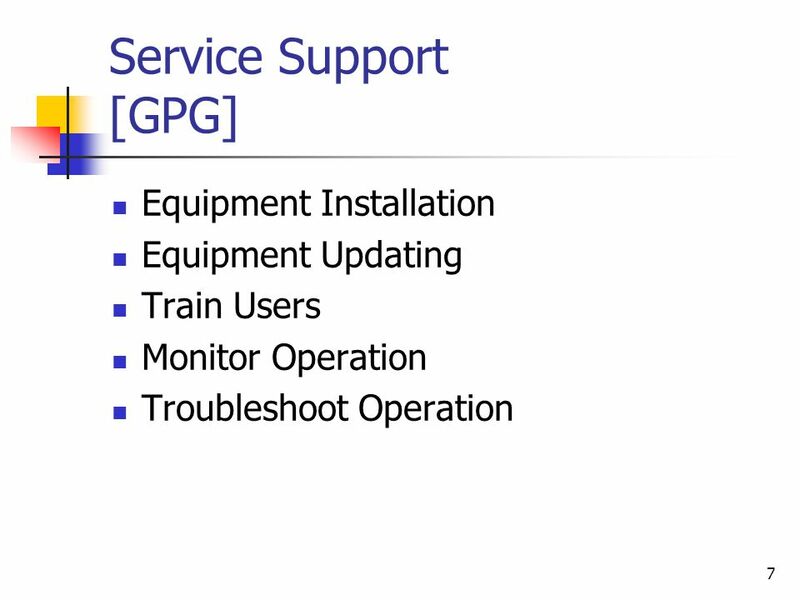 Any MXP or 460.18/.19 compliant systems can traverse an end user firewall for easy access to GRO network. 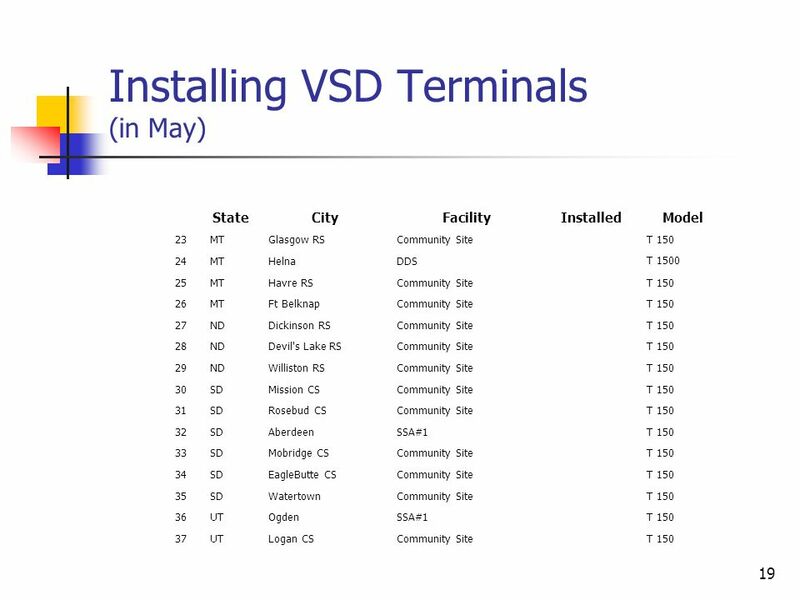 May eliminate need for individual DSL circuits at each location. 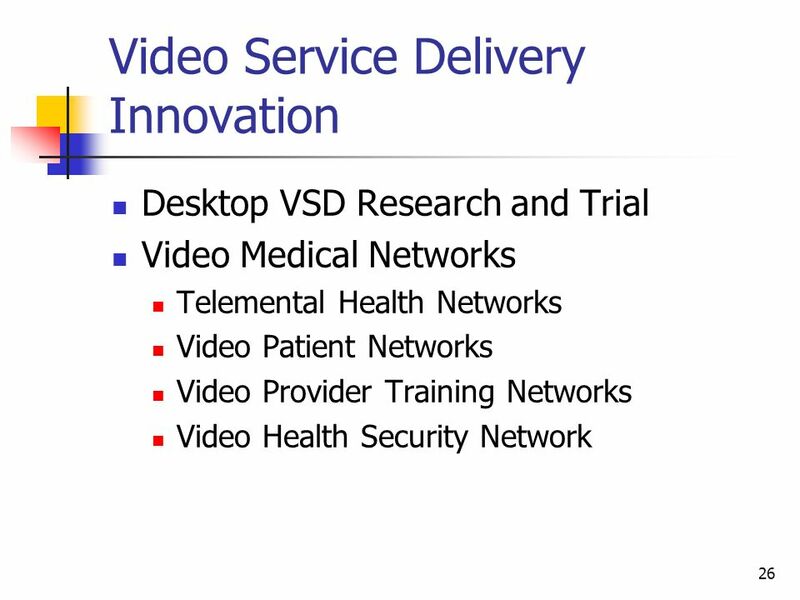 16 16 Video Service Delivery Innovation – Video Internet The use of "video networks" to provide government/healthcare services is increasing. 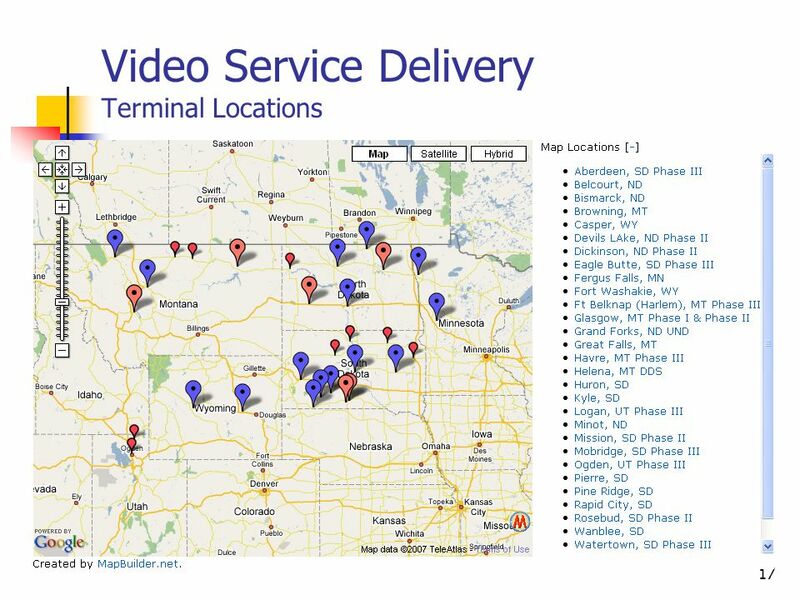 Within these networks, client-side video terminals provide a remote point of service (POS) for citizens to access the network owners services. 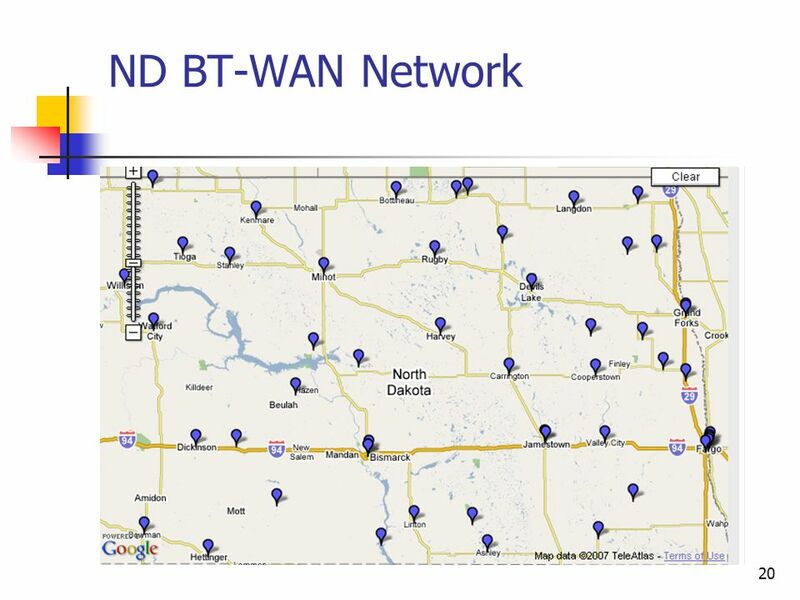 Presently, in North Dakota, video network services are provided by (to name some): Veterans Administration Indian Health Services Social Security Administration Bio-Terrorism Wide Area Network (BT-WAN) Interactive Video Network North Dakota University System K12 Tele-Pharmacy Network From a technology point of view, most client-side video terminals in any of these networks can access services in any of the other networks. In addition, most any PC with a "web cam" and access to the Internet can also (technologically) access these services. 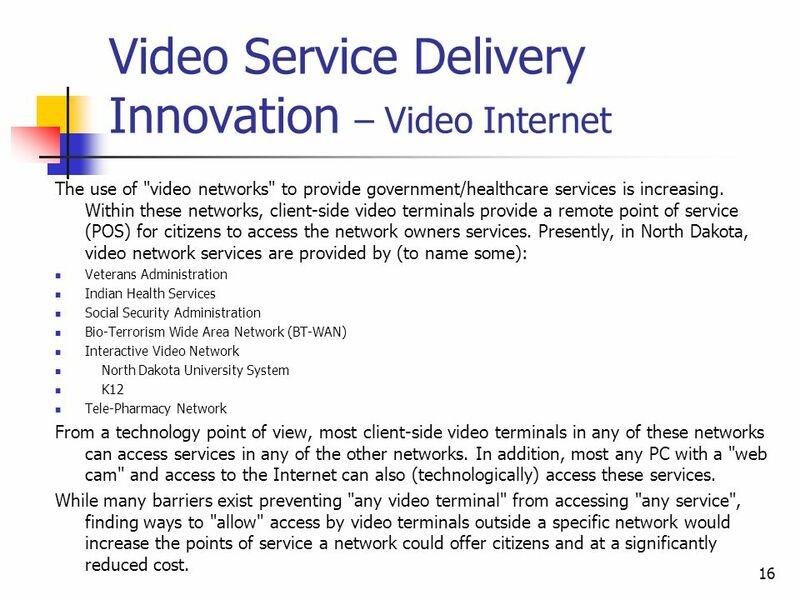 While many barriers exist preventing "any video terminal" from accessing "any service", finding ways to "allow" access by video terminals outside a specific network would increase the points of service a network could offer citizens and at a significantly reduced cost. 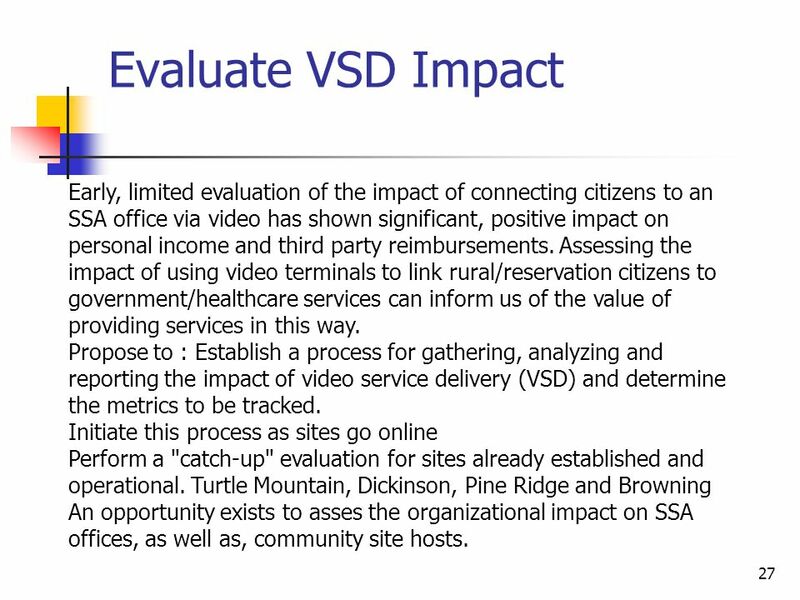 27 27 Evaluate VSD Impact Early, limited evaluation of the impact of connecting citizens to an SSA office via video has shown significant, positive impact on personal income and third party reimbursements. 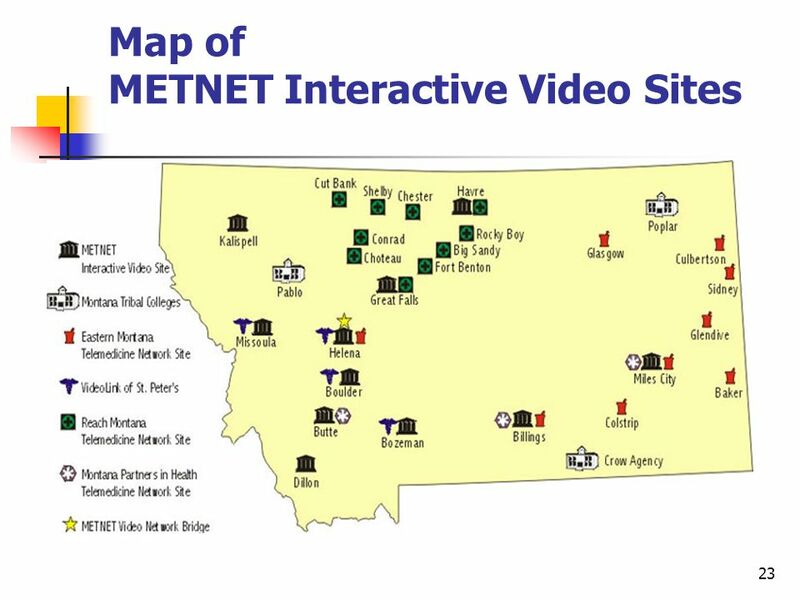 Assessing the impact of using video terminals to link rural/reservation citizens to government/healthcare services can inform us of the value of providing services in this way. 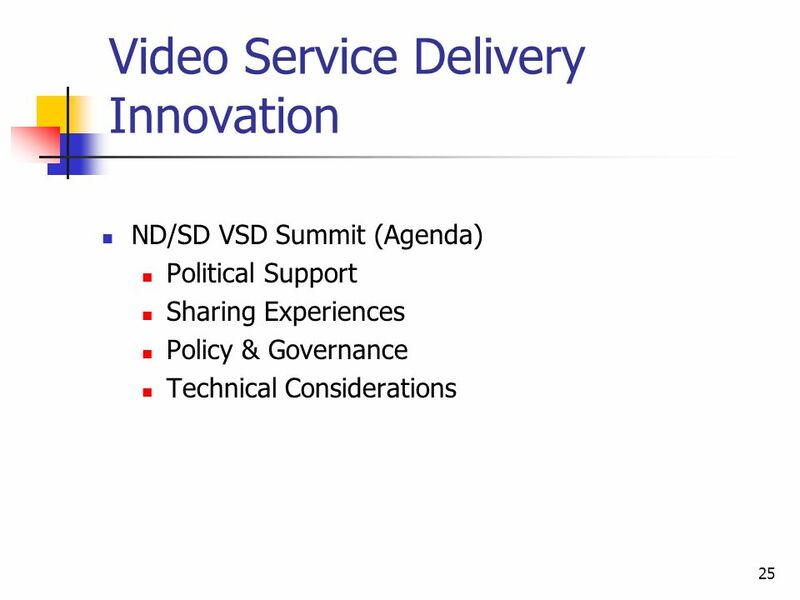 Propose to : Establish a process for gathering, analyzing and reporting the impact of video service delivery (VSD) and determine the metrics to be tracked. 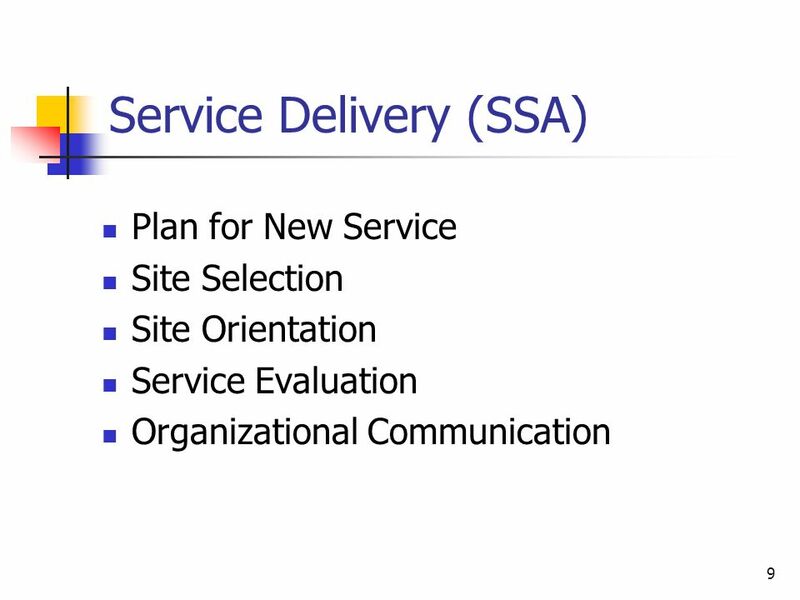 Initiate this process as sites go online Perform a "catch-up" evaluation for sites already established and operational. 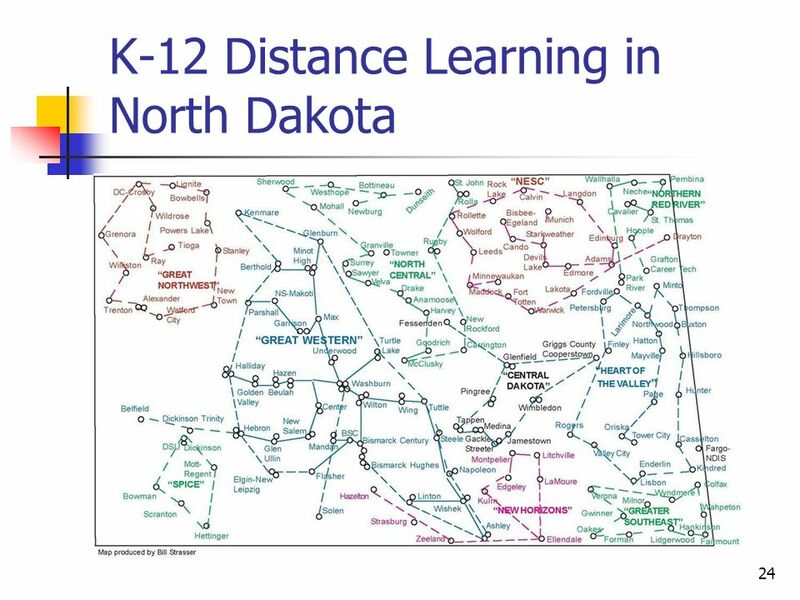 Turtle Mountain, Dickinson, Pine Ridge and Browning An opportunity exists to asses the organizational impact on SSA offices, as well as, community site hosts. Download ppt "1 RSD Today/Tomorrow? 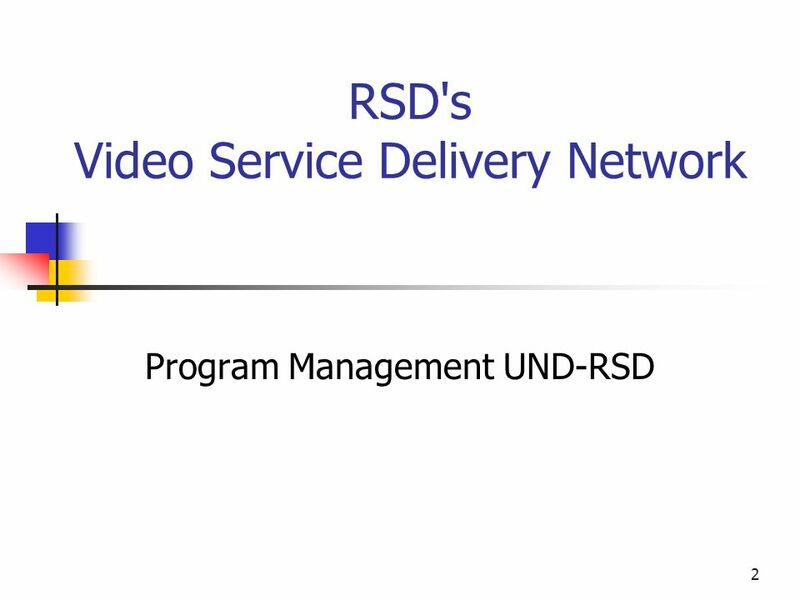 RSD's Video Service Delivery Network Future Projects." 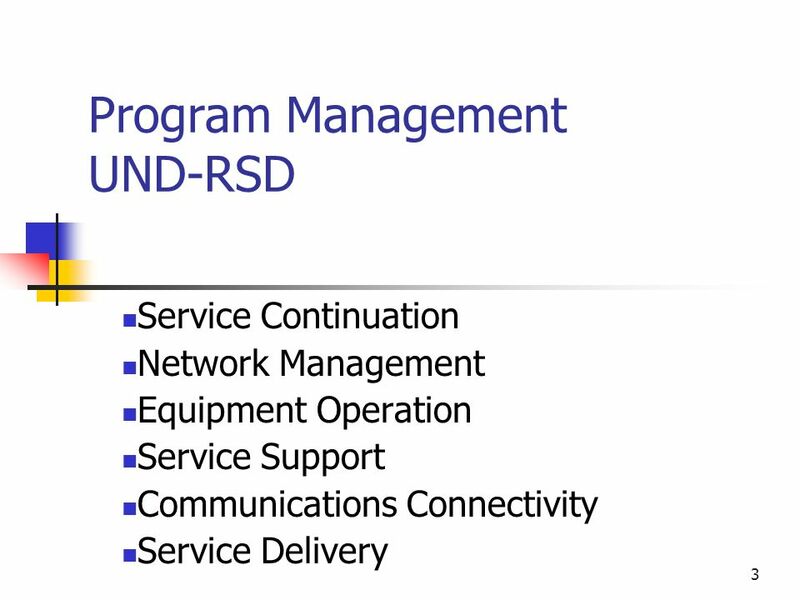 1 Introducing the Specifications of the Metro Ethernet Forum MEF 19 Abstract Test Suite for UNI Type 1 February 2008.